What’s New in Microsoft PowerPoint 2016? Microsoft PowerPoint 2016 is the most visually packed application in the whole Microsoft Office suite. The user interface (UI) has really not changed much from the PowerPoint 2013 application; some features have been developed to make the application more user-friendly (especially to touchscreen users). Instead of having to create and edit projects through drop-down menus, you now can easily find what you need in a Tab and Button layout. 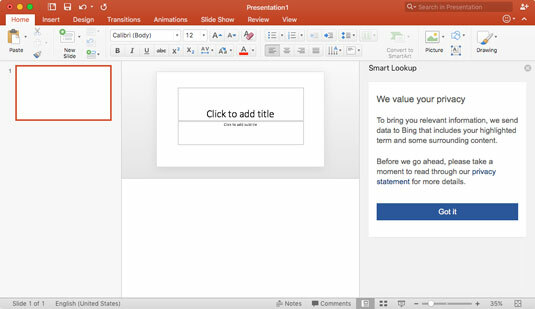 PowerPoint 2016 offers Smart Lookup among other new features. The new layout is also included in the 2013 release, however, for Mac users this is a new and welcome addition to the Office UI. The new replacement of “Clippy” the paperclip assistant, Tell Me, performs in the same manner but in a more visually appealing way. You can ask a question related to the Office suite, and it locates and performs the function you are asking. To access the Tell Me function, simply type your question or command in the search bar located in the top right corner of the application. For example, you can type “Add Slide Transition,” and Tell Me will do the dirty work for you. A drop-down menu will appear below the search box and will show a list of transitions from which you can choose. Simply click the appropriate option, and it will add it to your project for you. Also known as Insights from Bing, Smart Lookup enables you to locate and connect related data from online sources to your PowerPoint project. This includes images, research, 3D maps, web articles, and even video. To use Smart Lookup, simply right-click or hold-click/hold-touch the content you want to gather data about and select Smart Lookup from the drop-down menu. Select the content you want to add to your project and drag and drop it to the appropriate location. Microsoft has added six new chart types that are crucial to data analysis and keynote storytelling. The new charts formatting options remain the same as with PowerPoint 2013, so creating these new charts is as easy as 1-2-3. Microsoft has added an easier way to add math to your project. With Ink Equations you can draw out your math equation, and Ink Equations will reformat it for you before you insert the equation into your PowerPoint project. To add a math equation to your work, navigate to the Insert tab and click or tap on the Equation button in the taskbar. Draw out the equation like you would in a notebook using either your finger/stylus or mouse. After the equation has been drawn out, a preview of it typed out will appear above. If this is the equation you intended to draw, click the insert button to add it to your work. With PowerPoint 2016 you now have the ability to collaborate projects in the cloud as well as the capability to send emails directly from the PowerPoint share button. Now you can clip screenshots and record video actions with the Screen Recording button. Instead of explaining a process you now can show it firsthand. To access the Screen Recording button, navigate to the Insert tab. Because PowerPoint 2016 is an open beta, features can be changed, updated, removed, and even replaced by newer better features at any time. If your device performs an Office Suite software update, make sure to read what new changes are being implemented before using the software. If you are using Office 2013 and have updated to the most recent version, many of these new features will also be available to you.